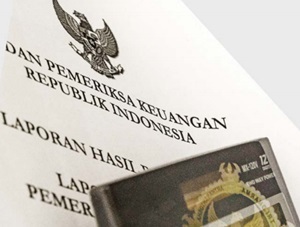 Badan Pemeriksa Keuangan Republik Indonesia - BPK is the Audit Board of the Republic of Indonesia. BPK is the independent state agency in Indonesia which has the authority and responsibility of examining the management of state finances. BPK is domiciled in Jakarta and its head office is registered at Jl Gatot Subroto Kav 31, Central Jakarta 10210. Badan Pemeriksa Keuangan now has 16 Regional Offices under Auditama V, and 17 Regional Offices under Auditama VI spread in all over Indonesia. According to information found in BPK's websited as cited by JobsCDC.com, the organizational structure of BPK comprise of 9 board members, with the composition of 1 chairman and member, 1 vice-chairman and member, as well as 7 board members. The Board members of BPK was elected by the House of Representatives (DPR) with respect to consideration of the Regional Representatives Council (DPD), and was inaugurated by the President. Since 21 April 2017, the chairman of BPK is Moermahadi Soerja Djanegara. S1 Degree in Psychology (5 formations). S1 Degree in Accounting (194 formations). S1 Degree in Law (50 formations). S1 Degree in Economics Development Studies (45 formations). S1 Degree in Communication (10 formations). S1 Degree in Management (50 formations). S1 Degree in Literature (10 formations). S1 Degree in Informatics Engineering, Information System (48 formations). S1 Degree in Environmental Engineering (10 formations). S1 Degree in Civil Engineering (46 formations). D3 Degree in Office Administration, Office Management (2 formations). D3 Degree in Communication, Public Relation, Journalism (4 formations). D3 Degree in Mechanical, Electrical, Automotive, Building (4 formations). D3 Degree in Information Technology (17 formations). D3 Degree in Archive, Information System Management (7 formations). JobsCDC.com now available on android device. Download now on Google Play here. Please be aware of recruitment fraud. The entire stage of this selection process is free of charge. Badan Pemeriksa Keuangan - 502 Formations D3, S1 CPNS BPK September 2018 will never ask for fees or upfront payments for any purposes during the recruitment process such as transportation and accommodation.